Close-Up-Portraits is a series of 4 portraits, which can be used as a necklace, a toy, a tesbih or as an artpiece on your wall. The Close-Up-Portrait series are one-of-a-kind pieces, made with beads in onyx, coral and pearls (salt, sweet and cultivé). The smiles aren’t perfectly white; these yellow smiles are made with vintagedeluxe glass beads. All the faces have 14kt golden locks on the top in the middle. Hi, I’m Pepper. I am the son of Virgil and Tilly. I am the owner of the Powder Box Girls. Hi, I am Tilly. I am a nail artist. The longer the better is my motto. Hi, I am Virgil. I am a friendly Harem Keeper. I own several Harems. The Gem Kingdom of Mimi Berlin: inspired by her friends and jewelry brand “Gem Kingdom” Mimi Berlin designed three Dreamhomes/Traum-Haüser. One for the city, one house for the country and a boudoir. Detail of the City Home or main building (1 x 1.20 m) Adjustable assemblage, mounted on a transparent perspex stand. 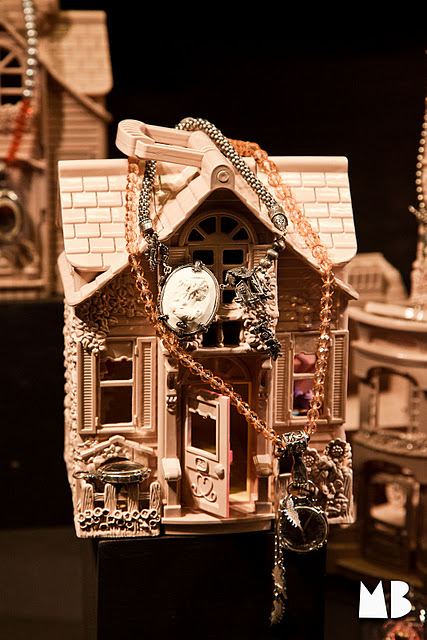 A house for the country: jewelry case in the shape of a small, standalone cottage with altered interior in black. Mimi Berlin created an installation with the Dreamhomes/Traum-haüser for the Christmas 2011 Shop Window of the Gem Kingdom jewelry flagship store in Amsterdam.The Dreamhomes/Traum-haüser were part of the 25th anniversary exhibiton of Gem Kingdom at CODA, Apeldoorn in 2015 and at H.P. France Theatre, Tokyo in 2016. Eggcups/Eierbecher, Prototypes are six series of eggcups: Surrealist, POMO, White, Stories, Retro and Souvenir D’Amour. Mimi Berlin designed three to four designs per series. All Eggcups are signed and handmade with VintageDeLuxe materials such as porcelain, glass, and ceramics.